You can download 9 great alpha transitions from Apple. 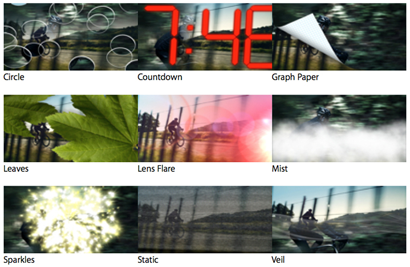 These are the same alpha transitions that were release with Final Cut Pro 7/Studio 3. This was one of my favorite transitions in FCP7 and now its in FCPX. Download the Alpha Transition Content from apple at this link here. This is what it will look like after you add, your clips. NOTE: This has been updated to support clips up to 5 seconds. To install expand the ZIP archive and add the folder to the Motion Templates folder in the Movies folder of your home directory. Add Effects to the Effects folder and Transitions to the Transition Folder. Some Tech notes worth mentioning. 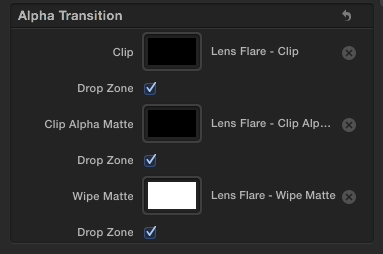 While adding all 3 types of clips allows for the Alpha transition to perform just like it did in Final Cut Pro 7, adding a Wipe Matte Only does not create the desired wipe only effect. 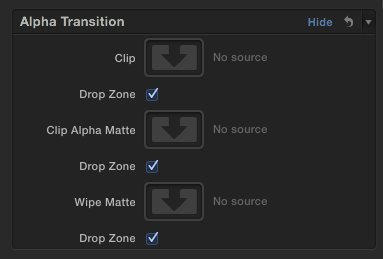 To get the same wipe only effect that was possible in Final Cut Pro 7, add your wipe matte to the Wipe Matte drop zone and the Clip Alpha Matte drop zone. This will produce a clean looking wipe. Again this is only if you have a Wipe Matte Only and not any of the other clips. To create your own wipes using this transition, the “Wipe Matte” must go from White (Full Opacity of the outgoing Clip) to Black (Complete Transparency of the outgoing clip). Thanks for taking the time to create this. To install expand the ZIP archive and add the folder to the Motion Templates folder in the Movies folder of your home directory. Add Effects to the Effects folder and Transitions to the Transition Folder. Hopefully that helps. Take Care! yes please make avideo tutorial on installing and useing this alpha trasition for fcpx. A great idea which I loved in FCP7 but I have struggled getting it to work properly. There was only your installer which came up after download–no folders. Checked and nothing in Effects folder but is in Transitions folder. I keep getting ghosting with the wipe matte lagging behind the clip. Is there an alignment adjustment? Hi Mikey, I’m sorry didn’t see it, after install your plugin, there was a new “transition” on FCPX transition panel called “Made by Mikey”, and there was in the inspector pannel the setup window for a new alpha transition. Thank you anyway! I’ve installed your package & downloaded the alphas from apple. Whenever I try to drag a video (e.g. Circle – Clip.mov) into any of the Clip or Matte areas, it is ignored. I only see the down arrow. Any ideas? Unfortunately, with Mavericks, alpha transitions seem not to work anymore ! Thanks for all your plug-ins, they are great. Everyone, for this plug-in, after you load it, in the program as it’s running, go to transitions, scroll down to (Made By Mikey) then you will see a (Alpha Transition). Apply that to a scene. Now you would see a blank white transition with an arrow and nothing happens. Because you have to add the alpha clips from Apple manually. Just drag the 3 black and white transition clips that you want from Apple, just like any other movie clip into your scene. Then in your transition info window on the top right, you have 3 blank box with the same blank arrow. Then Manually drag each alpha clips into the blank arrow boxes. Make sure the wipe Matte/Alpha Matte and Clip goes into the correct box. the 9 alpha transitions. the folder .dmg has 0 octet. I have a folder on my desktop with all this 9 “.mov” files.